Hello readers! This is the first time WIAW post doesn’t have an additional post name. Nothing too exciting happened today (Monday) so I really can’t name this anything. 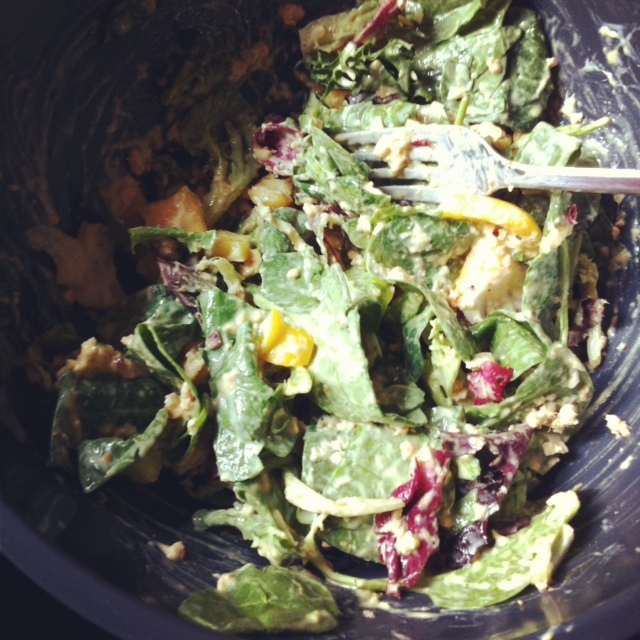 Well, it was very healthy. Which makes me happy. Ever since I got my Fitbit Ultra, I’ve been really motivated to stay healthy and active which is great! 🙂 I’m also really sore today. But yeah, enough chit-chat, let’s get to the GRUB! 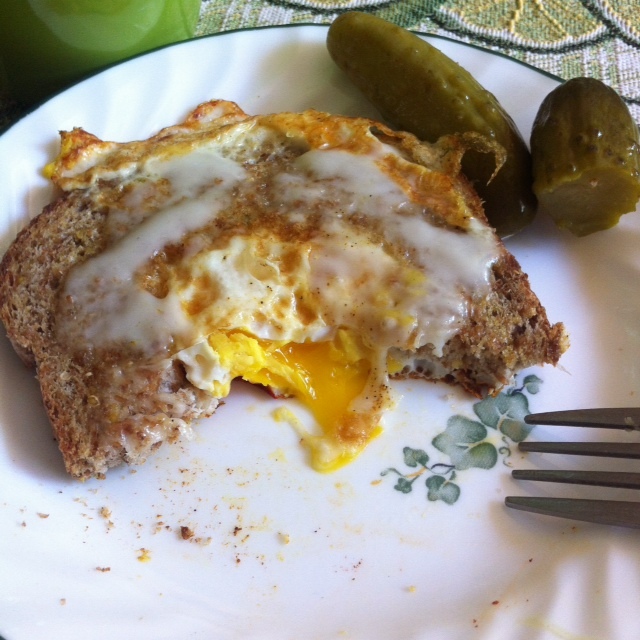 For breakfast I decided to add something more starchy and included ezekiel bread along with one large Amish egg, topped with some melted Dutch goat cheese, and some polish dill pickles. I also had like 2 cups of rooibos tea. I am a tea fanatic, as you might already know. 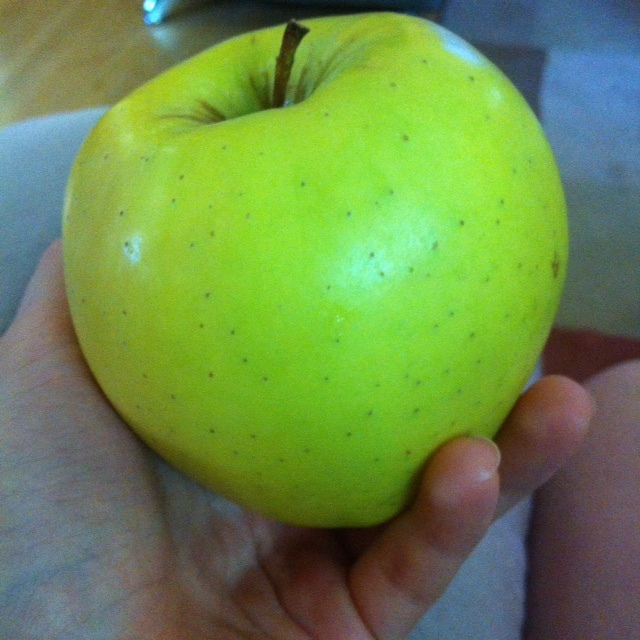 Then about an hour and half I had a delicious apple. I went home from the suburbs and upon getting to my apartment I got my stuff ready and went to do a interval cardio workout and yoga for an hour total. I made myself a protein shake as a recovery meal but the shake tasted really bad so I threw it out. 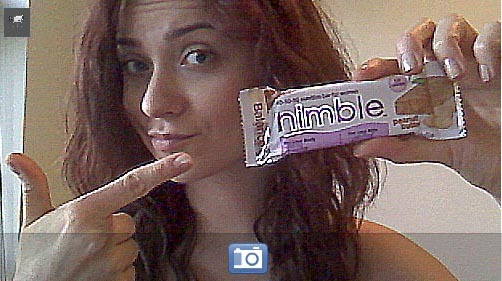 Instead I went ahead and ate another one of the amazingly delicious Nimble bars. I’m honestly obsessed. Make sure you try them for yourself for FREE if you win my giveaway for nimble energy bars and QuickieChick gift set. I wish I had another box for myself. I already ordered another one. They are to die for. Seriously. Not just saying that. Then it was time for my chiropractor and some Trader Joe’s shopping. I didn’t get all of the veggies I wanted to because tomorrow I’m planning on waking up early and going to the nearby Farmer’s Market! Woohoo! So excited! When I got home, I microwaved my vegan pear and currant bran muffin and topped it with some Amish apple butter. I love this apple butter, I’ve never had any before but this one rocks – it only has three ingredients: apples, apple cider, and spices! No sugar! And it tastes really good. What was the favorite thing you ate today? Happy WIAW! It all looks you. Thanks for sharing. Ooh what do those little old bars taste like? Are they just an average protein bar? That muffin looks awesome! My favorite thing that I ate today was probably peach pie! I’ve never had a peach pie before, sounds delicious! Apple butter sounds delicious! Your eats all look so yummy! I think my favorite thing I had today was this massive sweet potato with some butter and salt. Mmmm I LOVE sweet potatoes! Great choice. I’m a pickle and gherkin fanatic! I never think of them at breakfast though, yum! Fresh fruit is a favorite right now. One of my favorite things about summer. Off to enter your giveaway and check out the vegan muffin recipe. Goat cheese is delicious, I will have to keep an eye out for Dutch goat cheese (does it taste like Gouda?) Just looked at your pear & currant muffin recipe, it sounds good, I’ll have to give it a try! Everything looks tasty! 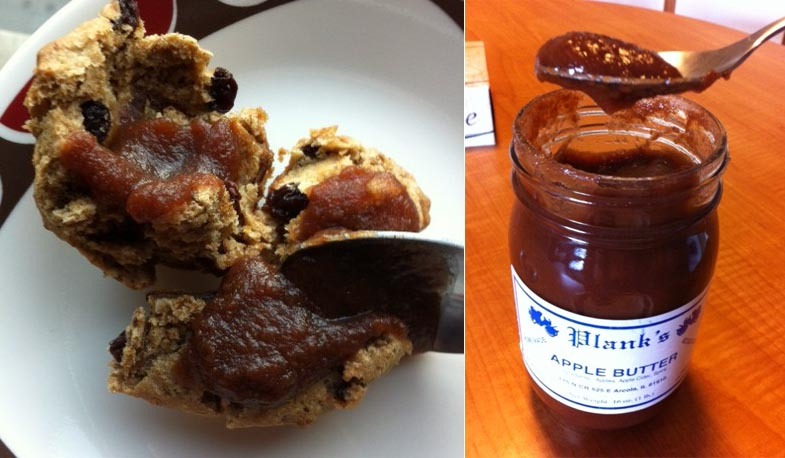 I love apple butter and no added sugar bonus!!! I am so craving an egg sandwich right now!!! Before I was vegan, “nest eggs” were a childhood favorite. You don’t know anyone in Central PA do you? Half you eats are so German/Pennsylvania Dutch! I know what you mean about knew foods via blogging. Mine was chia seeds. Haha really? Maybe that’s where I belong? haha. Ohh I need to try Amish cheese! …I’m a tea fanatic too! I saw those poached eggs on your blog and I loved the look of them. Yumm. I’ve actually never poached my eggs, I always fry them. Maybe I should try switching it up. I like apple butter, but love pumpkin butter even more. I get so excited when I learn about new foods or techniques from other bloggers. I have YET to try pumpkin butter! Now I’m even more curious if it’s better than apple butter you say..
Great eats! I love seeing these kinds of posts, it gives me tasty ideas for the next day. 🙂 I love all those healthy foods!